" Starting from Friday (3/16) morning, we do traffic engineering"
East Jakarta Transportation Sub-dept. is looking to apply traffic engineering at Jalan Raya Pulogebang and Jalan Soemarno. It is carried out to parse traffic congestion. Andreas Eman, Section Head of Traffic for East Jakarta Transportation Sub-dept. said traffic engineering is only done to the vehicle coming from Jalan Raya Pulogebang toward Jalan Soemarno. Vehicles can no longer directly use to the bridge over the JORR toll road toward Jalan Soemarno but must turn left first to Pulogebang Terminal and spun into the traffic light in front of the terminal. Then vehicles will be directed to Pulogebang Bridge and then continued to Jalan Soemarno. 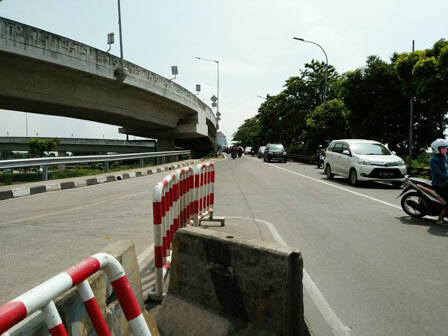 Previously, vehicles from Jalan Raya Pulogebang can use the bridge of JORR toll road toward Jalan Soemarno. "Starting from Friday (3/16) morning, we do traffic engineering. Yet it is only for vehicles from Jalan Raya Pulogebang toward Jalan Soemarno. While the reverse direction is still normal as usual," he told, Wednesday (3/14). He continued, the traffic in the area is crowded everyday, especially at rush hour, in morning and evening. In addition, vehicle volume is also very dense. In the afternoon, the congestion can reach the Buaran Traffic Light. In the afternoon, the congestion tail can be seen from the traffic light Buaran. "We've prepared officers in the field during the traffic engineering trials. But if it is permanent, we will turn on the traffic light in front of Pulogebang Terminal," he uttered.